Treats and Helps Prevents Acne Breakouts. Great for home or on the go. 1) Unclogs pores for clearer skin 2) Controls oil to prevent future breakouts 3) Retextures for a smooth complexion. Use a pad to cleanse and cover the affected areawith a thin layerof medicine 1to 3 times daily. Because too much drying of the skin may occur start with 1 application, then gradually increase to 2 or 3 times daily if needed or directed by a doctor. If bothersome dryness or peeling occurs reduce application to once a day or every other day. Sensitivity test: apply product sparingly to a small affected area for the the first 3 days. If no discomfort occurs, follow directions above. For external use only. When using this product keep away from eyes, lips and mouth. If contact occurs, flush thorougly with water. Skin irritation and dryness is more likely to occur if you use another topical acne medication at the same time. 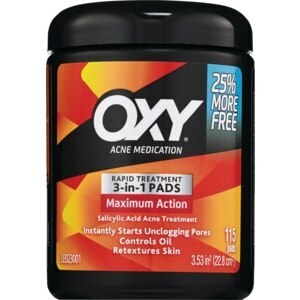 If irritaion occurs,only use one topical acne medication at a time. Do not leave pad on skin. If pregnant or breast feeding, aks a health professional before use. Keep out of reach of children. If swallowed get medical help or contact Poision Control Center right away.